Just few years ago, Italy was a Country with more people than spaces. Nowadays, we’re living the opposite conditions: Italy is a Country full of spaces but without people. In Italy we build 8 meters per second, the urbanization rate grew of the 400% between the Post-War period and the 2000, in the same period, the population grew only of the 27%. Depreciation of real-estate goods, due also to the increment of the supply-side of the market, generated an over-production crisis that, as occurred in Spain and in US, has been the origin of other and more complex difficulties of the entire economic system, generating other structural crises. It is not a case, thus, that this economic phase is lasting since 2008 and that today in Italy we have more than 6 million real-estate goods that are unused or underused (that is two times the city of Rome completely uninhabited). These goods are residential buildings (5 millions), public, semi-public and private buildings as, for example empty factories or abandoned industrial buildings, abandoned schools, buildings owned by mutual aid societies or People’s House cooperatives, Winemaking Cooperatives, colonies, and other closed spaces owned by municipalities (hospitals, neighborhood branches, schools and other spaces donated by private citizens as e. g. bequests), abandoned rail stations, buildings confiscated to the mafia, ghost towns, unused road worker’s houses, and many other cases could fill in the list of the parts of Italy that we let go. 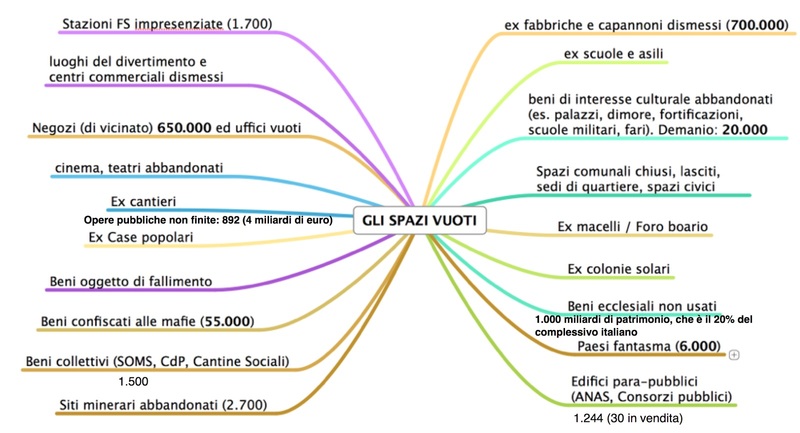 Based on data expressed in figure 1, the Censis (the Study Center for Social Investments) states that Italy represent a country with a non-acted capital, because Italy monetizes just a very few part of its Cultural Heritage ( about EUR 330 billion). Furthermore, we have to add the money-value of the assets that public and charity institutions could inherit by 2020 (almost EUR 105 billion) from 340 thousand families that have no sons, relatives or cohabitants. Nevertheless, today the availability of spaces is increasing also due to changes and transformation of productive processes, prompted by new manufacturing models, which underline that the productive system that ruled our economies during the last 60-70 years is neither the only possible choice nor the more efficient one. These evidences are signals of an economic transition, which points out the end of a society based on the binary logic that counterposes the supporters of a public-oriented approach to the supporters of a private-oriented paradigm. This remodeling action of the current economic paradigm, implies a diverse conception of the cities and of the inhabiting. Today, more and more proposals relate to “hybrid spaces” that, until recently, were conceived as marginal sites or “historic memories”. These proposals are a clear proof that today we’re making the future, and that this future is made by innovation, micro-enterprises and creative talents, as well as by the engagement and the active roles of the communities. These experiences have cultural, innovative or creative vocations, and they’re often represented by participative-bottom-up experiences. No matter in which geographical areas they’re located nor the initial intended use of the spaces involved. What it really matters is that the objective of these experiences is to fill those spaces with passions, ideas, talent, and competencies. Starting from the peripheries. Figure 2 confirms that today, the topic of the re-use or the regeneration of spaces, is a topic that relates particularly the urban territories, above all medium and large cities, where the empty-spaces’ phenomenon is well perceivable because of its dimension and its spread. In small cities and towns, the topic, even assuming reduced dimensions, represents an interesting opportunity. This is proved also by the number of participating projects to the Culturability call for proposal: 522 submitted projects and one third were located in Puglia, Sicilia and Campania. Furthermore, data about the previous edition underlines that the 40% of the submitted projects were located in small towns. Other confirmations come from the ministerial call for proposals: Giovani per la valorizzazione dei beni pubblici (Youth for the valorization of public-owned goods), which was aimed at re-using common spaces located in the regions of the “Obiettivo Convergenza”. The participation has been enormous: 590 submitted projects and 66 of them have been funded. The re-use and the valorization of empty spaces is a phenomenon that, in most of the cases, grows spontaneously, more and more starting from the private initiative of citizens, often young pioneers and other teams composed by cultural and social innovators. These emerging actions remain out of the spotlight but, thanks to the relevance of the initiatives that take place in this spaces, the awareness that this process could represent a new economic model, based upon new values and paradigms, is increasing. In the same way we assist to the birth of new “knowledge factories”, co-working experiences, start-up incubators and accelerators, green building projects, new places for the arts and the culture, new welfare hypotheses, sharing economy forms (where the usage prevails over the property), strategies of valorization of intangible assets (starting from knowledge and training), renewable energy, urban regeneration and social innovation actions. Added to this, it is useful to remember that the implemented re-used experiences, have transformed underused buildings in common spaces, and that the projects that embraced club or private logics, are very few. By analyzing these experiences, we can underline that most of the cases are built upon cooperation and the sharing, as well as an interdisciplinary approach in problem-solving activities, where knowledges are preceived as a tool and not as a goal. These experimentations give rise to these new places that represent new Botteghe di Mestieri e di Professioni” that we could compare with the “renaissance workshops” that contributed to the exit from the economic crisis of previous era (the Middle-Age) and built a class of innovators, artists and inventors of such a relevance that today we’re still talking about it. In a more recent period, a “bottega” has been the garage of Steve Jobs in Palo Alto, with his LPs of Bach and Janis Joplin, the books about hippies and the zen culture, a place that he shared with other colleagues and from where he started his great adventure. As well as a “bottega” have been the Andy Warhol’s Factory or the Beatles practice room, etc. The difference is that, during those years, many were looking for exclusive spaces, while today these projects are looking for shared spaces. The relevance of this sharing attitude is crucial, because it is for this attitude that new experiences are able to face several and more complex issues. These projects attempt to re-using and renewing empty spaces, proposing a multi-dimension and deal with culture, arts and creativity, innovation, social impact measurement, welfare, networks development, economic sustainability, youth employment. 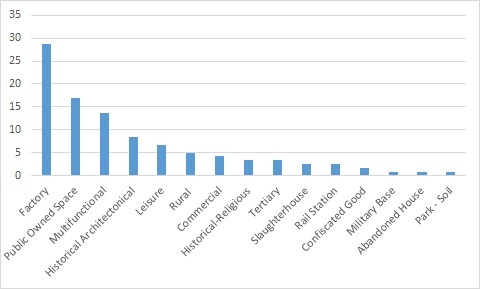 The re-birth and the re-use of urban (and non-urban) empty spaces is a current topic, which is assuming important quantitative and qualitative dimensions (see figure n. 3) also in terms of employment. The last report realized by Censis, states that in Italy, the number of employees in cultural sector (304.000 employees, which represent the 1,3% of all the employed people) is less than half of the cultural employment in Uk (755.000) and Germany (670.000) and it is lower by far from the number of cultural employees in France (556.000) and Spain (409.000). On the other side, regarding places that could be re-used or the valorization activities, culture could represent the starting point for great social impact plans, counting on cooperation procedures and both physical and metaphysical spaces in which citizens, private organizations and public institutions could start co-design development paths. These experimentation are not naïve. People involved follow precise sustainability plans, and they often create new cultural or social enterprises, which are aimed at diversifying the revenues and that are more and more independent from public subsidies. This autonomy is the result of a strong awareness about the role of Bank Foundations, the participation to calls for proposals and, above all, it is the result of a strong activity carried on about the research and the development of new audiences. There are 5.000 re-used spaces in Italy, with EUR 1 milliard of global turnover, but the most interesting aspect is that these acrvities create new jobs where earlier there was an empty space. Finally, two observations about the cultural sector. Italy is the Country of the “widespread beauty”, not only in main cities, but also in the small town of inner areas that could suffer a supply-crisis. The demand-side, however, is interesting. The Censis detects that Italians expect a strong improvement to their quality of life thanks to the requalification of culturally relevant heritage . Schools or Training Centres in fields related to the development of Cultural and Creative Enterprises, above all, centers that offer an integrated theoretical-practical training courses. Centers involved in multiple activities with specific objectives and that realize activities of territorial development, often organized as a territorial agency. Key Aspects: Strategic and multi-sectorial approach applied in urban and territorial contexts. Places where the food supply is associated with planning activities, training, aware consumption, development of ethically and ecologically sustainable food production chains, food design experimentation. Centers for art production, focused on contemporary expressive languages and/or cross-media research, included, when it occurs, the artist-in-residence formula, the realization of events, round table and Festivals. Innovation Centers that propose an hybridization of several productive and experimental activities. Their distinctive characteristic is the quantitative and qualitative relevance of the central thematic that they choose to deal with. Key Aspects: New Urban Economic Experimentation, Solution Ecosystem for the urban and territorial government. Work and life environments based on the sharing paradigm. In these places the object of the sharing varies: houses, rooms, tools, equipments and operative models. The distinctive characteristic is the community-building approach, the cooperation and the sharing about specific products, services, life-styles or value models. Neighborhood centers where are realized activities aimed at reaching both cultural and social positive impacts. The adopted approaches show high-level of interconnection between cultural, social, ethical and ecological orientations. The objectives of these centers are often related to the improvement of community welfare frameworks and the enhancement of social inclusion, by adopting innovative approaches and projects. Centers that have young people as specific and unique target. Often these centers represent the implementation phase of a young-addressed policy. They include Childhood Centers, School’s Laboratories and Centers for the sports aggregation. Key Aspects: Center for youth integration and aggregation. Aggregation Centers equipped for diverse entertainment activities. This model include clubs and associations focused on specific topics. Key Aspects: Centers aiming at combining leisure activities with social, political and environmental responsibility. Active Citizenship’s Initiatives are often realized within urban public spaces that are acknowledged for their relationship with important topics, such as historical events, their specific functions, shared collective values, symbols, storytelling and public needs. These activities are aimed at underlining the public value of those spaces as a symbol of the community. Key Aspects: Renewal of the sense of citizenship and community belonging. The creation, development, re-definition and the empowerment of cultural and cognitive services as museums, public libraries, archives and documentation centers, urban centers, etc. These centers are deputed to the realization of different activities that aim at creating new production chains and/or innovative products or services, starting from the development of initiatives related to the care of the environment, by connecting rural activities, training processes and by focusing on topics related with the food aspects. Different practices that create networks composed by underused or non-used spaces in order to realize within these places, activities addressed to the tourism demand. Key Aspects: Innovative Tourism Processes, Nomadic, Temporary and Dynamic Citizenship. Parts of Cities and/or Territories that are involved in conversion projects, programs or processes, and in urban transformation/regeneration actions. They’re represented by large areas, interested by the activity of public projects and by real-estate development actors. In spite of the increasing spread of re-use projects and experiences, there are still many difficulties we need to deal with, as the lack of cooperation between the cultural and financial systems or the lack of an adequate legal entity (particularly for the cooperation with public and semi-public entities). Other issues that our cultural system should resolve, are represented by the lack of planning skills in low-cost environments and the economic sustainability of the cultural enterprises in the medium and long run. Even more relevant are, finally, governance and management procedures in a substantially informal environment and, above all, the bureaucratic rules about the real estate authorizations, that are often too tight for these places, whose most peculiar characteristic is an uncertain vocation and an uncertain intended use. The management function of these spaces, that in most of the cases are concerned with the hic et nunc dimension, with the urgent and with the solution of already emerged issues, has little time to elaborate a strategical planning, and this evidence highlights one of the more relevant management topics for these experiences: the lack of coordination. This is proved by the fact that, today, there is no a formal network for these places, but are frequent strong informal relationships.